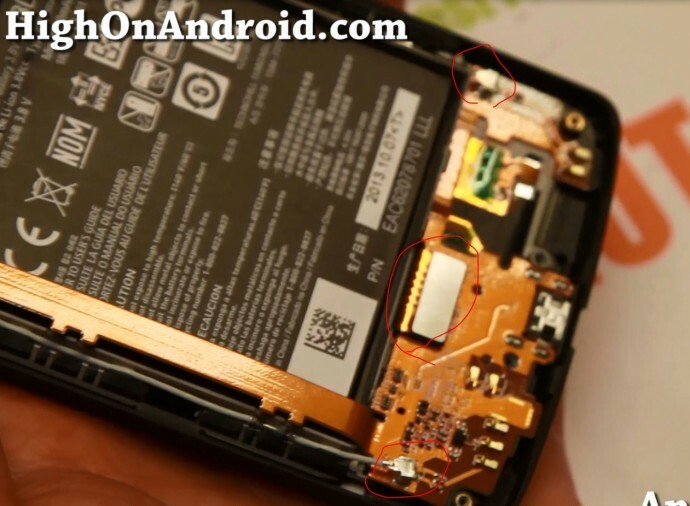 How to Disassemble Nexus 5 for Repair! If you ever break your Nexus 5 screen or perhaps your USB stops working, you may be able to repair the Nexus 5 yourself as it’s a phone that’s made easy to repair. In the future that you do need to repair Nexus 5, here’s a video tutorial and step-by-step guide to help you disassemble the Nexus 5 down to the screen/frame assembly. Step 1. Start at the USB port module and slide the plastic tool (or plastic knife) and get between the back cover and the phone. DO NOT USE any metallic tools as it will scratch your Nexus 5!!! Step 2. Once wedged in-between the back cover and the phone, very slowly slide your plastic tool all the way around the phone until it pops out. The bottom of the back cover has some adhesives so you may need to slide something long (such as a plastic knife) along the bottom half of the phone to get it off fully. Just take your time and do it really slowly, you will be able to get the back cover off eventually. Step 3. Once the back cover is off, you will need to unscrew all visible screws. Unscrew all of them that you can see. Step 4. Use the plastic tool to pull the bottom speaker cover out. It should pop out very easily. This bottom cover contains your speakers. If your speakers ever break, you can replace this part. Step 5. Next, undo the two antenna cables and also the LCD flex cable. Step 6. Use the plastic tool to pry out the top cover also. This should come off very easily. Step 7. Undue the big flex cable on top of the battery, the battery flex cable, and two antenna connections. Step 8. To take the bottom USB board out, start at the left side and slowly slide your plastic tool (or plastic knife) to the right. The right side of the USB board is stuck with some adhesives, you just need to gently pull “very slowly” until the whole USB board comes off. If your USB ever starts malfunctioning, such as not working or perhaps only works when it wants to. You can replace the whole USB board (it might be called USB flex cable) and usually you can get these on eBay for around $2-10. Step 9. Undo the flex cable for your rear camera and also the front camera. Once that’s done, you should be able to pry the main motherboard out easily using plastic tool. Step 10. This is the motherboard that contains your CPU, GPU. If you ever hard-brick your Nexus 5 (although that’s probably near impossible), you can replace this board to get your phone working again. Make sure you buy a motherboard with clean ESN as there are many on the market that may be off the black market with bad ESN. Step 11. If you are going to be replacing the screen/digitizer assembly, you most likely need to pull additional modules like the rear camera, the phone speaker, 3.5mm headphone jack, and the front camera. The cameras are held in place by adhesives so just gently and slowly pulling them out should pop them out eventually. Step 12. The battery is held in place also by adhesives. I found you can stick a plastic knife under it to get it separated from the adhesives then the battery will come out easily. Step 13. Once everything is out, you can pretty much reverse the disassembly process backwards to get your phone assembled again. If you have trouble, watch the video tutorial before trying. Overall, I would have to say the Nexus 5 is just as easy to disassemble as the Galaxy S4 and Note 3, both which I was also able to disassemble easily. 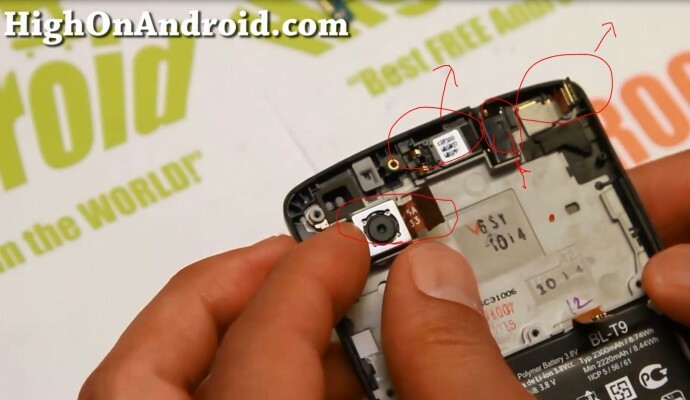 How to Disassemble Galaxy S4! How to Disassemble Galaxy Note 3! How to Replace Broken Screen on S3! How to Disassemble Nexus 7 2013 Edition! Next story Nexus 5 DROP TEST with a CruzerLite Case! Previous story Nexus 5 Unboxing!